@pipatronic: Your output quantity is really amazing ;) Thanks! This reply was modified 2 years, 8 months ago by Anti. Well I hope it is helpful to all, the biggest problem I have is lack of time, there is some really superb information on this forum if you go back and dig deep. Awesome work Sir, thank you. As I know red/yellow dots lag one/two bar(s). For using this concept in our trading we should know on which dots we should pay attention and which dots we can ignore, because @gg53 told us that we never mind what happened between this dots. Any ideas penguins? I think we are in right path. In down-swing, some candles LOW is lower than the previous candles LOW in that swing, some are not. A candle LOW is always lower than all the previous candles HIGH, and this is the invariant for a down-swing. Maybe this concept helps us to find exact dots? Hmm … look at the examples in pipatronics video. The question is: How would you trade this. Before I did own experiments I’ve thought that we get trading signals whenever one true bar engulfs the preceding one. However, as you may see from the examples in the video, if we see the engulfing in most cases the trend is over. Ok, we could trade it this way: We wait until an unfinished true bar engulfs the previous bar and enter then. But this seems to be similar logic than trading band brakes using Donchian channels. Maybe GGs concept of the river bed is more valuable. My idea for its us is that we compare the line for smalles lookback period to each higher lookback period lines. Whenever the median of the smaller channel is in the upper or lower third of the higher channel, we see a strengthen up/down trend regarding those TFs. Hi @anti, can you show your thoughts in picture-examples? I’ve tried to summarize it in the below image. To show these yellow (smallest), red (longer) and blue (longest lookback period) channels, I’ve used Simplex’s RiverBed_v1_1_post indicator which has been posted at this forum. The yellow channel now should show the high/low range of last 5 candles, the red of the last 15 candles and the blue of the last 60 candles. Whenever the yellow channel is narrow and in the upper part of the red channel, we should se a short-term up trend, if it is at the lower third of the red channel, then we have a down trend. The same is true for the position of the red within the blue channel. Jo do you know about clear method candles ? Thank you @anti step by step, I hope I’ll understand how “to catch fish” @pipatronic I have candles-indicator which was created by @takhang (sorry if I spell wrong). Do you mean this indicator? just did a comparison between red dot yellow dot (as in video ) vs clear method candles – more predictive vs lagging ? The analogy: more water (Volume) are coming into the “River” but encounter a narrow creek (smaller Range), so they must deflect and find new, different path. Roll up your sleeves. G.
After studying the volume concepts laid down by GG I found this one again. After adapting and filtering with higher TF signals I obtain sometimes quite accurate turning points. However, what me really wonders is this: We can often see turning points with a high volume and a high range. How does it fit in the water flow analogy? Why should the river change its direction after the flood leaves a big river bed? Additionally I found a problematic behavior of tick volume in MT4 (and probably with other platforms, too) … a tick doesn’t neccessarily mean a chang in 0.1 pips. Sometimes it can mean a change by 0.2, 0.3, … pips. However, the volume only counts these changes as 1 tick. Thus, you can see very efficient candles where the prize path (abs(open-close)+2*wicks) is bigger than the volume itself. Is this a problem? Any recommendations? Hi Anti, i have followed this thread for long time, but just as a good reader … :) I try to give my opinion on this : GG said about Volume(x) compare to Volume(x+1), Range(x) compare to Range(x+1), High(x) compare to High(x+1) / Low(x) compare to Low(x+1), Close(x) compare to previous candle (x+1) to get the Higher probability of turning point. But as you said, some times big volume and big/Small range does not change the direction. May be this idea can not be taken as main signal, but it is for filtering of other idea, for example in addition to Similarity method (just my Self opinion …) ? 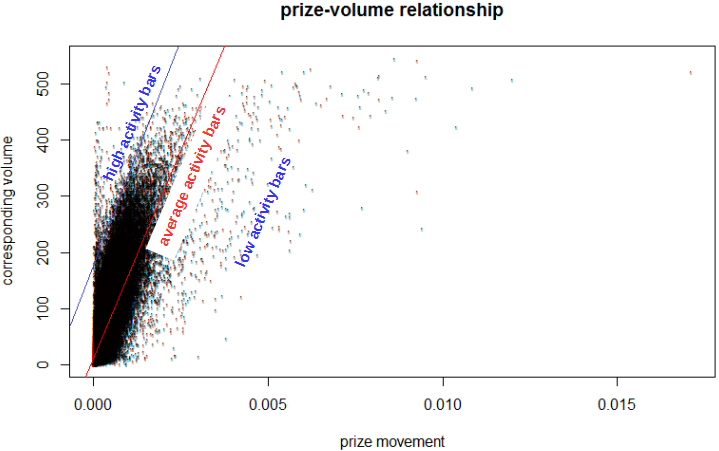 As you can see, there seems to be a linear relation between volume and the prize path. The red regression line explains more than 64 % of the total variation in volume. However, the dots above the blue line indicate bars with more than average volume in comparison to their prize path, and thus more activity per pip. I think that these candles can be seen as exhaustion candles. It’s quite interesting to see how most of these exhaustion candles have relatively high volume and quite small prize paths (“ranges”). This is exactly what @gg53 mentioned in his formula (see 3 posts above this post). Nevertheless, there are some low activity bars, too. They appear in the lower right part of the plot. I think they can be explained with an erratic prize movement in one single direction during the lifetime of the corresponding bar. With “erratic” I mean that prize developed with jumps (e.g. a jump from 0 ticks to 0.3 ticks, etc.). If we now use the formula for the regression line and subtract the expected (average) volume for each bar from the real tick volume, we may get a measure for the excess activity … I’ll attach my indicator with the hope that we can continue our work on this topic. However, since we are most probably using different brokers, the formula I obtained for the relationship between prize path and volume may be different than the optimal solution for your broker. Additionally, the formula only applies for M1 charts. If possible, the algo should be timeframe independent. Generally, I think it would be interesting to learn about the constants (12.12; 148200) when looking at specific symbols to cover that part. There will be systematic variations. The price part 2*(High-Low)-MathAbs(Open-Close) obviously is not timeframe independent, its value will grow by a factor of sqrt(2) * (tf1 / tf2) sqrt(tf1 / tf2). Hence your constants will vary systematically over different timeframes. Considering the modification 2*(High-Low) / MathAbs(Open-Close) you might overcome this to simplify further usage. What should remain is non-systematic variations (noise) over different timeframes. Any thoughts? This reply was modified 1 year, 5 months ago by simplex. Reason: Nonsense formula corrected!